Appealing to 1st time buyers or INVESTMENT OPPORTUNITY, this is a superb opportunity to purchase a delightful well presented 2 bedroom property with an additional attic room which can be used as a third bedroom offering plenty of space for a growing family. Formally 2 back to back properties knocked through with added benefit of a generous size rear garden and 2 useful cellars for extra storage. 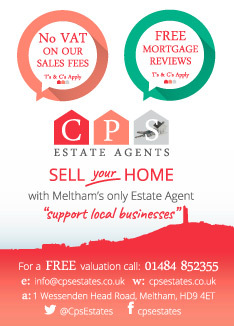 Conveniently located close to the popular centre of Meltham and local primary school. This would make an ideal purchase for a growing family. Briefly comprises of Entrance hallway, well presented lounge with gas fire, dining kitchen with an array of wall and base units, free standing appliances and plumbing for a washing machine, access to the rear garden and cellar. To the first floor, there are 2 double bedrooms with built in storage, family bathroom with panelled bath, WC sink and pedestal, leading to the attic conversation which can be utilised a third bedroom. The property has the benefit of GCH and double glazing throughout. Enter through a UPVC door into the entrance with door leading to the lounge and stairs to the first floor. Extremely well presented reception room, with UPVC window to the front elevation, allowing the room to be light and airy.Gas fire, laminated flooring and door leading to the dining kitchen. Generous size dining kitchen offering ample of space for a growing family.with a range of wall and base units and complimentary work surfaces,free standing appliances,plumbing for a washing machine and built in cupboards for extra storage. The kitchen provides access to the cellar and rear garden. Good size bedroom tastefully decorated, with two windows to the rear elevation and views of the garden. Built in wardrobes and radiator. Double room with UPVC window and exposed open fire place. Radiator and ceiling light. Comprising of a panelled bath with screen, low flush WC and hand basin. Partly tiled walls and obscure window. Door and stairs leading to the attic conversation. A remarkable room with sky light window. Currently used as an additional storage room but could make another bedroom. A fabulous size garden, benefiting from a delightful patio area and enclosed lawn area.A fantastic garden for those summer evenings.